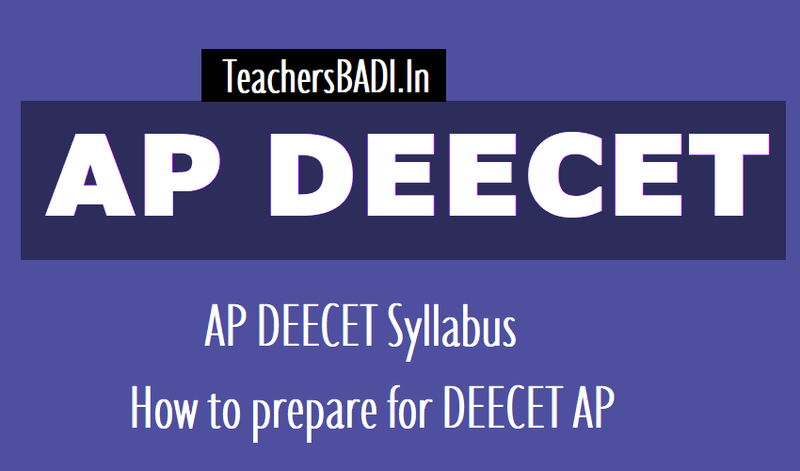 AP DEECET 2019 Syllabus,How to prepare for DEECET AP 2019: AP DEECET 2019 Syllabus,How to prepare for DEECET AP 2019: A Tree gives us food, shelters fresh air etc., A tree is a true friend of us. We all remember the tree but forgets about the person who sowed the seed, watered the plant, who took care at the stage of plant. In the same way a primary school teacher take care of the student in primary classes. Which this shows impact on his/her total life. As a gardener he/she plays very prominent role. It is most responsible Job. If you want to take such challenging job, if you want to feel such great satisfaction you have to know about AP DEECET(DIETCET). AP DEECET(DIETCET) is Diploma in Elementary Education Common Entrance Test. By getting through this exam, we have to study 2 years course D.Ed in DIETs or Private D.Ed colleges. After successful completion of 2 years course then we are eligible to write DSC. According to RTE, Candidates of D.Ed are eligible for SGT posts. So, we can gain a job at less age. If you are interested and dedicated you can lay your career path towards AP DEECET(DIETCET). (b) The medium of Entrance Test: Question paper shall be in Telugu/English or Urdu/English and Tamil/English only. or its equivalent or who studied as one of the above languages as second language in Intermediate exam are alone eligible for admission of seats into concerned medium viz. Telugu/Urdu/English/Tamil offered by the Institution concerned. (d) Only the candidates who obtain qualifying marks in the DEECET shall be assigned ranks as per order of merit. (e) No requests for re-totaling of marks, revaluation of answer scripts or personal identification of answer scripts will be entertained. (f) The DEECET will be conducted at different examination centers to be constituted at District Head quarters and any other places identified by the District Authorities. (g) Tamil medium candidates should write the test in Chittoor district Head Quarters only. The subject and syllabi of the test shall be of the standard of Classes VIII to X of Telangana State Syllabus for Part-II &Part III of the test. Who are eligible for DECET? Candidates aged 17 years upto 01-09-2019 can apply. Candidates should have 50% marks in Intermediate and SC,ST, PHC candidates should have 45 % marks in Inter compulsory. Inter vocational students are not eligible. The candidate should have secured 50 percent of marks in aggregate in qualifying examination for appearing in the DEECET both A & B category seats. The minimum percentage of marks in the case of Schedule caste, Scheduled Tribe and Physically Challenged candidates shall however be 45 percent for both A &B category seats. 1. Prepare by revising previous papers in the angle analysing the questions. 2. Read carefully whole syllabus and get grip on concepts. 3. Learn topics in the methods of application and analysing. 4. If you are very well-known with inter subjects, utilise the time to prepare other subjects of previous classes. 5. Questions from teaching aptitude will be basical. So, don’t worry. 6. For GK, refer GK Books and books related to education. 7. Along with subject knowledge understanding and application are important. 8. Write model tests, rectifying mistakes, continue reading. 9. Keep in mind that according to our AP DEECET(DIETCET) rank only we can get admission in to DIET or Other Private D.Ed Colleges. The Question Paper of DEECET-2019 consists 100 marks with objective questions. Part-A is common to all applicants. 1.Maths: Those who studied Mathematics as a subject at Intermediate level. 2.Physical Science: Those who studied Physics and Chemistry as their Intermediate Subjects. 3.Biological Science: Those who studied Botany, Zoology as their Intermediate Subjects. 4.Social Studies: Those who studied two subjects out of Five Subjects viz.,Civics, Economics, History, Geography, Commerce. sir i am 19 years old and BC-A caste. How much rank should i get in deecet to join govt diet college? sir i am 19 years old and bc-a caste. what rank should i get to obtain a seat in govt diet college?